And Nenad Trajkovski is the MVP that will help us understand the item a bit better. Let us know in the comments what you think, or better yet, vote! Well after 2 years there’s 25 people that voted on the item. Not much has happened, but then again, we are used to that a bit aren’t we? After 3 other UserVoice articles this is becoming a standard status for the MS Project UserVoice. But that is exactly why I started this series! We need YOU to care! If no one notifies Microsoft about the needs of the Microsoft Project community the company will just keep guessing. Ever since the big change, Project Online or Project Server UserVoices won’t be taken into account anymore. The needs described in those items might make it to the New Project Service or maybe even Roadmaps or Project Home. But the original items will be forgotten. This is not the case with the Microsoft Project items! Microsoft Project is here to stay! So keep that in mind when reading this article. Why would making start and finish dates read only improve the product? When reading the comments and the original item description, we get a distinct feeling that the experts differ on the need for this feature. Some, like B. Sai Prasad, recommend that we use Baselines to lock dates or hide the fields or even write a macro to disable. I used to advice people to hide the start and finish dates as well because of the unintended harm it could do when editing the fields without proper reason. Make start and finish dates read only a optional setting. This would be a major improvement in my opinion. And I’ll briefly describe the current and improved situation before I let Nenad give his opinion on the matter. These calendars describe a constraint! Most often this is a “Start no earlier than” constraint. These will hinder any dynamic schedule features you would like to use in a schedule. You would for instance be interested in shifting dates when tasks move, but because of the constraint, a situation might occur that isn’t true. Where a task doesn’t move because of these constraints, even though you know that it could move. In a small schedule this isn’t a issue, you will find these not moving tasks quickly. But what if your schedule exceeds the 200 rows? Will you pick up on every change then? Bottom line: every time you change the start or end date manually, you create a constraint. Is that what you wanted to do? Most of the time it isn’t and you wanted to link tasks to each other. I wrote about this situation earlier, and even did a YouTube video about it. Any person that considers himself/herself a proficient or expert scheduler will know that linking tasks and being scarce with actual constraints is the best practice. The item therefore isn’t meant for the proficient or expert user of Microsoft Project. But rather for the occasional scheduler. The person that picks up a schedule every month just enough to get a basic Gantt chart in place. This improvement would improve the experience of these people (of which there are WAAAAYYY more). In my opinion, it would be an improvement to lock the start and finish dates by default, and giving the expert users the option to disable this lock (in the menu settings for instance). It would be great if we could tell users that the start and finish dates are only there as a reference and that they should set the Project Start date, and move across the schedule by linking tasks to each other and setting the duration instead of changing start and finish dates. It should only be possible to set a constraint date using the separate column or through the tasks settings menu. I think there will be much dismay if Microsoft makes Start and Finish dates read only, but doesn’t give us the option to overwrite the setting. I am an expert user of the tool and know that I should only touch the dates if there is an actual constraint, so I would be hindered by a grayed out or locked field. I think that Start and finish date for Tasks should remain editable. Why? First of all if someone changes them accidentally it will be shown on the Indicator column as as small calendar with a blue dot (for semi flexible constraint) or red dot (for hard constraint). Second, it will be much easier for the user to change the constraint then to go to the Task Information screen, then to Advanced tab, and then to put in the constraint manually. And Manual and Auto Scheduled Tasks are not to be mixed here. Manual Tasks are intended for Tasks for which you do not have enough information, or not precise information. 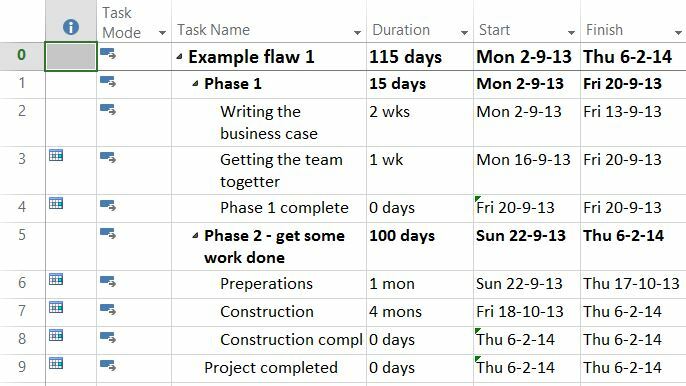 And yes, by the end of the planning phase, you should have all this information and it is best practice to switch all manual Scheduled Tasks to Auto Scheduled Tasks before you baseline the Plan. On the other hand putting Start or End date to Auto Scheduled Task is when you exactly know that you want to put a constraint and you know what kind of constraint is it. What I would suggest is to make start and end date as a non editable fields for all kind of Summary Tasks. Those tasks are from my point of view so called “Calculation” Tasks which are used to group Tasks for phases, and they show total Duration, Work, Start and End date, work, cost and a lot of other information which are not editable. This calculation task becomes Manual scheduled when you change start date, end date or duration. Which isn’t what you intended in any way. Nenad and I differ a bit on this subject. But that is oke! I value his opinion on Microsoft Project and see him as one of the best people to listen to when it comes to scheduling with Microsoft Project. I totally agree with him that summary tasks should be read only at all times. But I would like to have the option to lock start and finish for the occasional scheduler, to force them into using best practice approaches. It’s Wednesday today, and I would like to leave you with another request. I’ve recently started a YouTube channel with video’s about Microsoft Project and Reporting using Power BI. Every other Wednesday I post a new video. Have a look at the latest videos and if you can help the channel out, subscribe to it and hit that like button.